Capturing the perfect image on film is at the same time a moment’s work and a painstaking task taking much planning and patience. The light has to be just right, the location of the camera has to be carefully selected, the camera precisely set up. 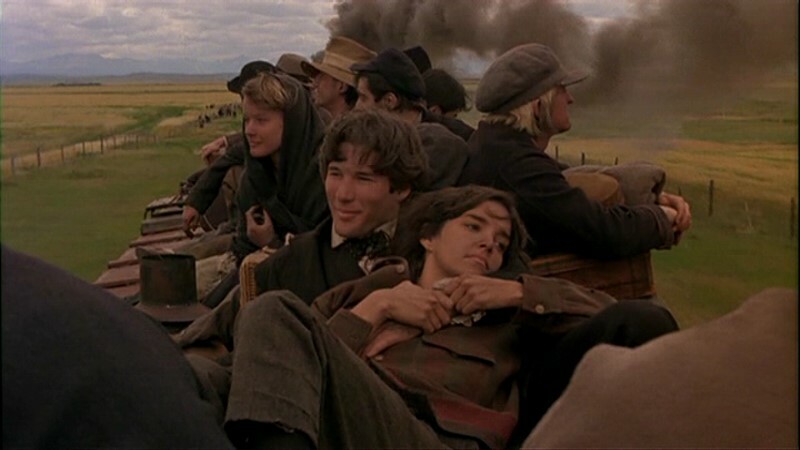 This is true of both the still and the moving image and yet I have seen few films in which the photographic quality is so clear as in Terrence Malick’s Days of Heaven. Press pause on the DVD player at almost any moment and there you have a perfect image; beautiful, meaningful, perfectly lit. Re-watching the film recently, I was reminded of a photographic exhibition I had seen of the work of Ansel Adams and Edward Burtynsky. The exhibition reflected the film not only because of the overpowering beauty of the images but also in terms of the central themes it shared with the film. Ansel Adams, like Malick, was evidently drawn to the beauty and the power of nature. I think in particular of his Yosemite photographs with the sheer face of El Capitan towering out of a valley swathed in the last washes of sunlight before a thundering storm. Burtynsky’s photographs provided a stark contrast in that they focus on the way in which man exploits nature. This too is a major theme of Malick’s work. 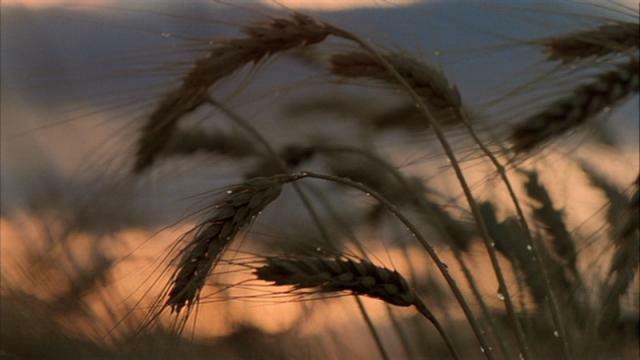 Days of Heaven is at once a film of great beauty, a homage to the search for perfection – a visual poem. It is also a film which explores contrasts; the constant tensions and pulls between opposites. ‘Nobody’s perfect. There ain’t ever been a perfect person around. You just got half devil and half angel in you’ says Linda, the bold little girl who narrates the film, providing her disjointed, naïve but often profound commentary on the events which take place. As her observations switch between innocence and knowingness she captures here the essence of one of the dominant themes of the movie; navigating the boundaries between good and evil. The three main characters of the film, Bill (played by a very young and very handsome Richard Gere), Abby (Brooke Adams) and the farmer (Sam Shepherd) are all flawed to greater or lesser degrees, and as with all tragic characters, it is their flaws which undo them. The film is set in 1916 and Bill and Abby are impoverished city dwellers from Chicago. They are lovers and forced to escape the city after Bill kills a foreman in a fit of rage at the steel mill where he works. They hitch a ride on the first train out of the city along with Bill’s little sister Linda and end up in the Texas Panhandle where they take on farm laboring jobs for a wealthy farmer. They pretend to be siblings rather than lovers to prevent unwelcome questions. Once on the farm, the farmer notices Abby and is obviously interested in her. After Bill overhears a conversation between the farmer and his doctor in which the farmer is told he has only months to live, Bill persuades Abby to try to win the farmer over and marry him so they can get his money. The plan goes well but then the farmer doesn’t get any sicker; a classic love triangle with disastrous consequences ensues. It might seem that Bill is the obvious villain of this set-up and it is certainly true that he has the most obvious flaws with his quickly roused rage and his manipulative abilities. But his ability for self-sacrifice, his fearless pursuit of his right to a better life and his stoicism while watching the woman he loves with another man prevent us from being able to hate him. Abby seems sympathetic, torn as she is between her love for Bill and her growing love for the farmer but yet she goes along with the plan and lets the tragic events occur around her. The farmer, who is a good man reaching out for a companion in his loneliness, is also fatally flawed; by jealousy. As the drama between these three characters unfolds amidst the vast, flat plains of Texas wheat fields (actually filmed in Alberta, Canada) we cannot pick out who is entirely to blame. Each of the characters has good and evil within them. So Malick allows nature to provide a commentary on their complex inter-relationship. The benign, bucolic landscapes of the early film are consumed in a biblical display of nature’s dark side in the form of a plague of locusts and an almighty fire. It is not only humans who are multi-faceted; nature herself is half angel, half devil and, as Linda notes in her narration, ‘the devil is on the farm’. Days of heaven really turn into days of hell. Nature is really another character in this beautiful film and Malick, like Burtynsky, is interested in the interplay between man and the natural world. Although the open plains and vast panoramas provide a marked contrast to the dirty poverty of industrial Chicago, we are reminded that, for all its beauty, the farm is also an industrial landscape. It is a landscape in which man and nature collide. In the Edward Hopper inspired shots of the grand farmhouse towering, isolated, over the enormous fields we are reminded that man is trying to take control here and is mastering this natural space for his own gain. The panoramic shots of the massive harvesting machinery in action and the detailed depictions of men and machinery laboring together to gather in the natural bounty reinforce this idea. But perhaps the most forceful image is of an old-fashioned tractor driving through a wall of spiraling flames, looming like a hellish, black monster as it moves towards us. But although man may try to control, Malick reminds us of our own insignificance. He does this not only through a major nod to the power of nature, but also through a clear depiction of the cycle of changing seasons in the wide landscapes of wheat. This is all enhanced by an almost obsessive desire to capture the glorious light of an impassive, immortal sky. Unlike many film-makers, Malick (and his cinematographer Nestor Almendros) tried, wherever possible, to film using natural light. Days of Heaven was largely shot in the hour preceding dusk, the so called “magic hour” when natural light is at its most beautiful. This made filming rather long as the shooting time each day was severely limited, but the results are spectacular. Experimentation, it seems, is part of the search for perfection and by pushing the accepted boundaries of film-making, Malick gets to his goal. The sky seems to provide a glow over the film, like a reminder of an alternative power. One might even describe it as God, if one were so inclined. This almost exclusive use of natural light also serves at once to give the film a very realistic look and also to give it the rose-tinted wash of memory. Since most of the film also takes place outdoors, it somehow takes us back to hazy childhood summers, to carefree days in the sun. Linda’s narration of the events also makes it clear that she is telling us this story. We see it unfold through her immature eyes, which explains the almost fantastical elements, especially when the flying Italian circus suddenly swoops onto the farm in a pair of brightly coloured planes. So the film seems real and yet impressionistic. But the constant reminders that we are watching a story told through the filter of a small girl’s eyes and understanding doesn’t stop us from feeling the tragic outcome of the tale. We are at once inside the story and removed from it; we are there and yet we also observe from afar. But this film is more than simply a tragic story set against the back drop of the inter-relationship between man and nature, it is most definitely a work of art. If the lighting provides a special dimension to it so too does the juxtaposition of the shots. Malick underlines his timeless, age-old plot by reminding us of its petty nature against the vastness of space and time. He does this by continually flitting between shooting the microcosm and the macrocosm; by contrasting the minute focus on an unfurling leaf or a locust eating through an ear of wheat with epic shots of vast, wild landscapes. He is telling us about a small world but he is also telling us about the whole world. And a great deal of this telling is done without words. The dialogue is kept to a bare minimum, sometimes giving the film a silent-movie feeling and yet the characters are complex, the acting nuanced. Malick spent over a year editing this movie; looking for the best shots, cutting the extraneous, putting the film back together to form a meaningful, coherent whole. The many frieze-frame moments he had captured during shooting were pared down to essentials. Again, the search for perfection involved a contrast between painstaking work and the spontaneity of the moment. Accounts from those who worked both in front of and behind the scenes in this movie reveal the tensions which arose because of this. Many of the camera assistants record frustrations with Malick’s creative process. They were directly opposed to his experiments with filming with so little light, as it was thoroughly against the rules of the way they normally worked. They were also angered by his vague scheduling and his tendency to make everyone drop what they were doing to capture a flock of birds flying overhead or a rabbit fleeing from a harvesting machine. Equally, the actors were dismayed on first seeing the movie that so much of their hard work had been simply cut out – vast swathes of dialogue were missing, whole scenes had been left on the cutting room floor. The search for perfection obviously involves bloody-minded determination and a degree of ruthlessness. 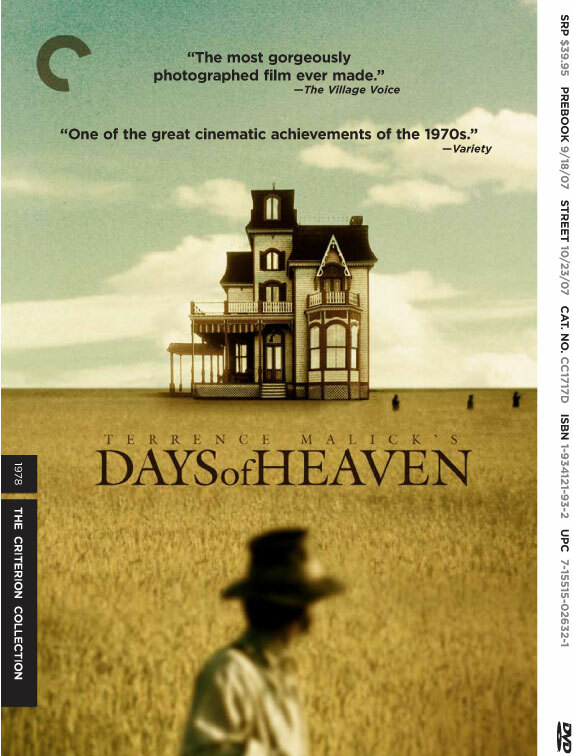 Unfortunately for Malick, despite having achieved perfection on Days of Heaven, I have yet to see another of his films which quite gets there. I guess the search goes on. So I look forward to The Tree of Life, his latest film, which comes out towards the end of this year, with a mixture of hope and trepidation. Katy Karpfinger is an Edinburgh University-educated Brit living happily in Boston, U.S with her German husband but without a work visa. She is therefore dividing her time between volunteering in a museum and writing her first novel based on the many stories of Burke & Hare and Edinburgh’s dark past. She is inspired by history, fiction and films. Malick’s insistence on filming in the dusk light reminds me of Kubrick’s work on Barry Lyndon – he found a special Zeiss lens that had been designed for NASA with an f 0.7 aperture and modified his cameras to incorporate it, allowing him to shoot interiors in actual candlelight. It’s another really beautiful film. I love Barry Lyndon too. It is a very beautiful film but I didn’t know that about the camera -interesting! Thanks for your comment!